What you know is becoming less important than what you can do. Is this true? Has it always been true? Some who believe the statement to be true suggest ubiquitous access to the internet means that it is not as important to have as much knowledge of facts and details as it used to be. Few suggest there isn’t some level of general knowledge required in order to make sense of new information but some argue online information storage relieves people of the ‘burden’ of carrying facts and details. Is it important to know of every provincial capital city in Canada if one has access and skills to search for that information online? I think that question is a conversation worth having particularly in reference to BC’s new draft curriculum and how education efforts are best spent. No doubt knowing and understanding are important, as is being able to do something with that knowledge and understanding. The question is what deserves greater emphasis: Less time spent memorizing capitals, more time learning about where to find that information? What I hope plays a more central role in the conversation is how so much knowledge and wisdom is not accessible online. Of course, digital literacy is essential for all learners and citizens, but as we encourage the development of skills to search for and make sense of information, it is important that students have the people skills – confidence, modesty, curiousity, respect – to ask others who have knowledge, skills, or wisdom in an area of study. I see these skills reflected in the Communication Competency of the draft curriculum but as skills related to accessing information digitally are newer skills than acquiring information by connecting with people, there is a risk the latter and older “people skills” may receive less emphasis in education. Delmar Williams teaching students how to make fire. knowledge they are willing to share in a particular area and great respect is afforded to the passing on of knowledge and wisdom by elders. 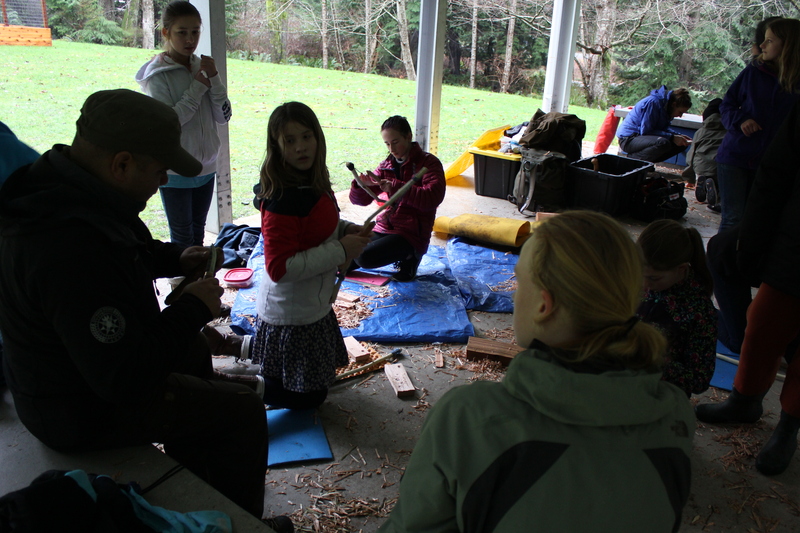 Lastly, Delmar Williams has worked with students in outside45 teaching earth-based survival skills such as carving and fire-making. There are online tutorials as to how to make fire with a bow drill but the wisdom of the best materials to use for a particular area and the history of the skills in various cultures is local knowledge shared by people in person more often than online. At TEDxWestVancouverEd in September 2014, Shannon Ozirny captivated the audience with a wonderful talk on “What is smart?” arguing “the ability to effectively search for, and filter information, take what you need from it, that’s what smart is.” Hearing this statement and listening to her talk, it is hard not to assume search refers to search online though her talk does not suggest where to search. As we encourage and develop students’ abilities to search for information and make sense of it, I think we will need to be increasingly mindful when working with generations who have always known of the power of the internet, that students have opportunities to search from a plethora of sources including people, places, and print. Perhaps the bigger message for me is the recognition that we are storytelling beings. We make sense of our world, our selves, and of others through the stories we hear and share. In an internet age where facts can be found with ease and speed, we need to make and take the time to find the stories behind the facts. And to learn to confidently add our voices to the stories we hear and learn in ways that are respectful, humble, and appreciative of the opportunities to connect with people, places, and print.